Nanotechnology — specifically the development of the Atomic Force Microscope (AFM)—has enabled researchers to touch and to listen to cells. Like the blind reading Braille or a hand touching a pulse, the needle of the AFM can touch and feel the vibrations of cells less than half the diameter of a human hair. In the same way a needle was used to feel the pattern of vibrations pressed into vinyl records, scientists have found that cells with cancer or other diseases emit a very low and strained frequency while healthy cells produce a more pleasant sound. This has allowed researchers for the first time to take living cells from human cancer patients and determine which are cancerous through touch. Artist Geraldine Ondrizek has amplified the vibrations of healthy and cancerous cells as part of Cellular, the centerpiece of the show, an installation of three projections of a developing spider embryo at a stage when it morphologically appears to be a human embryo. Ondrizek edited 10 different films of gastrulation to overlap and repeat the phases of development just before a recognizable body is evident. Editing the films right before the blastula becomes a distinct species renders the final video as one that could be of a developing human as much as an embryonic arachnoid. Through touching and hearing rather than only seeing, an entirely new way of studying a form—that of the multiple sensory knowledge—has been born. This ability to discern cellular soundings has ultimately revolutionized the understanding of cellular gestation, division, and the relationships within the interior architecture of our body. 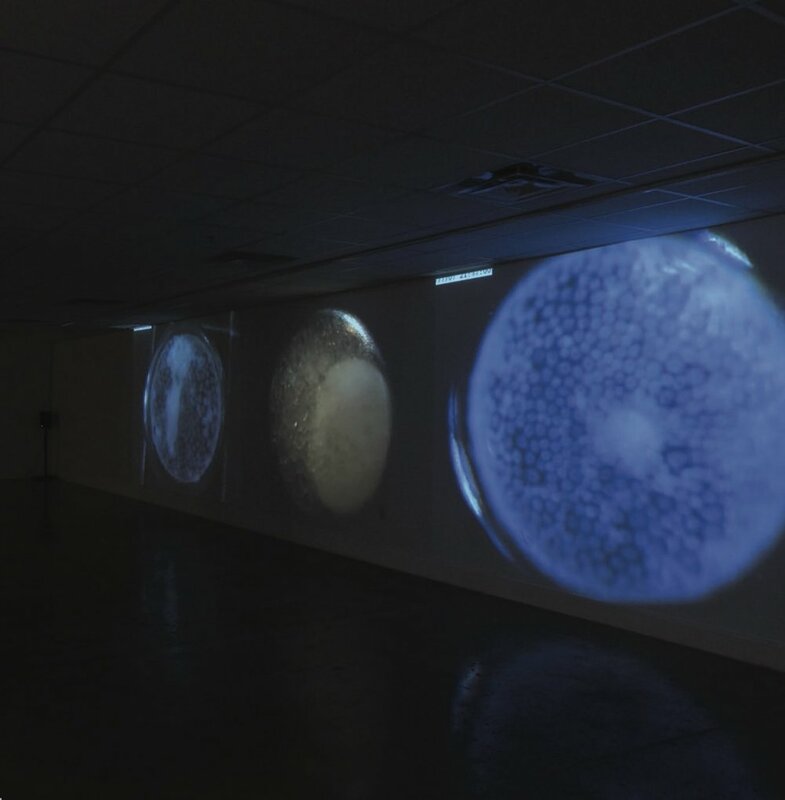 The projected images of Ondrizek’s work do not appear to be only of an orb of rapidly dividing cells (healthy or not); they also suggest the beginning stages of a planet in formation—perhaps even the initial moments of the creation of the universe—or a planet in the process of dying. The tension between the telescopic and microscopic, order and chaos, creation and destruction, as well as life and death are all kept taut rather than neatly resolved. Depicting the early development of a spider embryo, accompanied by the sound of cells as they grow and die. The Economies of Disease workshop and performance by visiting artist Marie Garlock developed alongside live audiences and started with the observation of the relationship between disease and consumer capitalist campaigns like the "Pink Ribbon" breast cancer movement. The workshop was based on Garlock's performance-centered work with persons facing life-threatening cancer and inspired by Geraldine Ondrizek's “Inner Space, Global Matter” exhibition. This interdisciplinary panel explored Ondrizek’s work through the lens of astrophysics, molecular biology, music and philosophy.